The Origins of the UK Podcasters Association. “Your right to podcast your own voice speaking your own words cannot be licensed, and should be a freedom for all in perpetuity” – UKPA Founding statement, March 2006. The UK Podcasters Association was formed as a result of a badly phrased press release from MCPS-PRS (the UK Performing Rights Organisations who control music licensing and revenue distribution on behalf of recording companies, publishers, writers and artists) which implied they were about to licence speech-only podcasts. UK podcasters answered this by forming a non-profit association, which produced this first articulation of podcasters’ inalienable rights. Since then we’ve attempted to make more sense of the situation by building and maintaining active links with the licensing bodies, entering into dialogue with UK government, and joining with other groups internationally to bring about recognition of our basic rights. Since April 2007 new members have been joining at around three per week, many of them also belonging to other associations and unions – NUJ, BECTU, Musicians Union, Radio Academy. We’re starting to get some good press for the AIM agreement which gives UKPA members a preferential rate on their podcast licence. The AIM licence gives access to a 30,000 track archive. Full length no-DRM tracks, for podcasters to use in their music podcasts. Radio stations typically remove music from their podcasts. 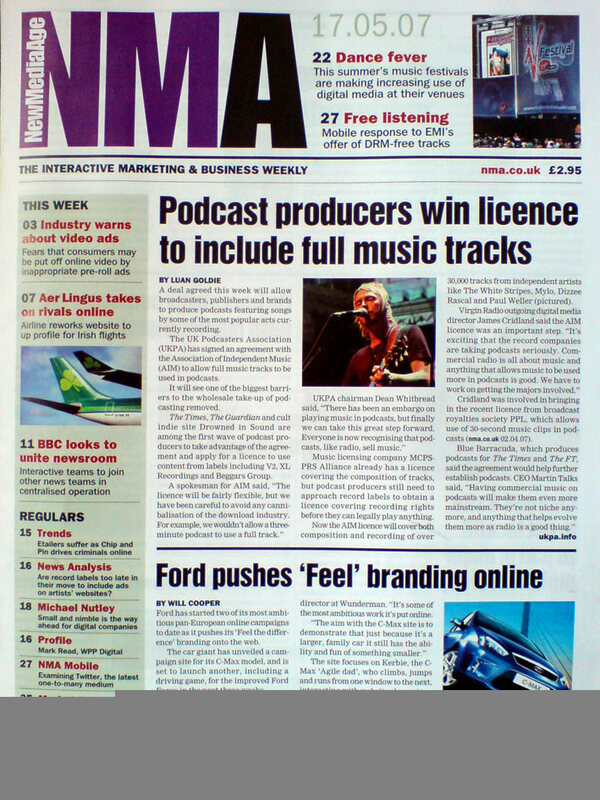 This gives UK Podcasters a unique opportunity to re-write the rules for music promotion, opening the door for podcasters to move legitimately into traditional broadcast territory, which will hasten the shift towards media on demand. The AIM podcast licence covers tracks licensed by the UK independent music industry and includes labels such as V2, XL Recordings, Studio !K7, Cooking Vinyl and Beggars Group. Revenue from the scheme returns to the labels, and artists will be paid as a result of podcasters using their music and paying the licence fee. If you are a member and you want to get the reduction, contact aimpodcast ->at<- ukpa.info and quote your membership number. If you are not a member, join.